Melissa Fite Johnson received her Master’s in English literature from Pittsburg State University in Kansas. She was the featured poet in the Fall 2015 issue of The Journal: Inspiration for the Common Good. Individual poems have appeared or are forthcoming in such publications as Valparaiso Poetry Review, Broadsided Press, Rust + Moth, Midwest Quarterly, I-70 Review, Inscape Magazine, 3 Elements Review, Red Paint Hill Journal, Period, Eunoia Review, Whale Road Review, Bear Review, The New Verse News, and velvet-tail. Melissa has poems in the Kansas anthologies Begin Again: 150 Kansas Poems and To the Stars through Difficulties: A Kansas Renga in 150 Voices, a Kansas Notable Book Award winner. In 2015, Little Balkans Press published her first book of poetry, While the Kettle’s On, a Kansas Notable Book and winner of the Nelson Poetry Book Award. In 2016, Spartan Press will publish Ghost Sign, a collaboration with fellow Southeast Kansas poets Al Ortolani, J.T. Knoll, and Adam Jameson. 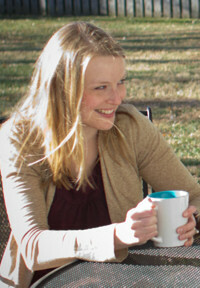 Melissa and her husband live in Kansas, where she teaches English. is propped up by the vacuum handle. sponge instead of mop. She’s tired. with spray bottles and paper towels. from flute smooth to caked fireplace ash. but the doused black matchstick. I tried hiding his cigarettes. tenderly as she did her collection of tea spoons. standing over a boiling pot. then purse your lips for a kiss. as he scatterpaws over hardwood. He shuffles, not limps, away. You exhale. the dishwand inside a coffee mug. to watch the replay on the muted TV. of bottled breast milk and dry Cheerios. No chubby arms reach for me. like lips desperate for words. my full attention. I have yours.